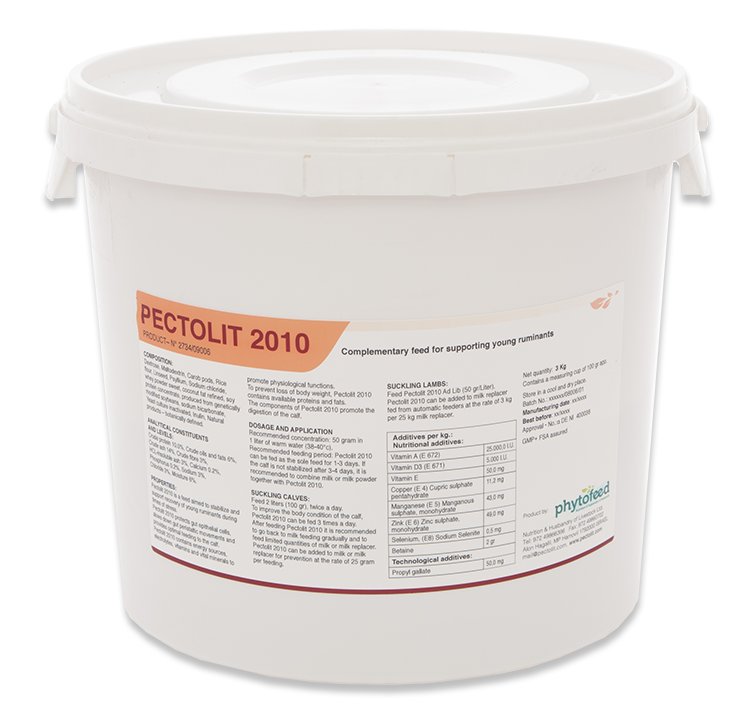 Pectolit is a complementary feed specially aimed to stabilize and support the recovery of young ruminants during times of diarrhea. Pectolit protects gut epithelial cells, slows down gut peristaltic movements and provides optimal feeding to the calf due to the different ingredients composing the product. Pectolit contains several energy sources, electrolytes, vitamins and vital minerals to promote physiological functions. Unlike most anti- diarrhea products, in order to prevent body weight loss, Pectolit contains available proteins and fats that keeps the calf from starving. The different compnents in the product promotes the digestion of the calf and recovery usually takes place within 2-3 days. Pectolit is highly palatable and even sick and weak calves will consume it eagerly. Pectolit is availble in different versions- Pectolit 2010, Pectolit 2010 GMO Free, Pectolit Pro. Pectolit is designed to help and treat young calves that suffer from diarrhea. When a young calf has diarrhea- stop milk feeding. Feed Pectolit twice a day (if the calf is weak and in bad body condition feed Pectolit three times a day). Use Pectolit at 50 gram per 1 liter, 2 liters per feeding= 100 gram Pectolit. Feed Pectolit twice a day. The dose is for a normal size calf (37-45 kg). For large calves or small calves the quantity can be adjusted. Dilute Pectolit in warm water (38-400c), mix it well and feed the calf. Pectolit is not 100% soluble but it will mix well into the water; after standing for some time particles tends to sink- usually the calf will consume all the components of the product. How long to feed Pectolit? Start with a 0.5 liter of milk and gradually increase the milk portion. How to go back to milk feeding? After the calf is back in a stable condition go gradually back to milk- feed limited quantities of milk (1 liter of milk + 1 liter of Pectolit) and within 2-3 feedings reduce quantity of Pectolit and increase quantity of milk. In case of sick calves (E. coli, Salmonella and other pathogens) Pectolit can be a good support for calf recovery during time of medication treatment. Pectolit is a safe feed with no risk for weak or for healthy calves; an extra dose can always help preventing dehydration or starvation.